I cannot believe it took me this long to make this. I mean, between Mac and Cheese and Kale Nachos, I seriously don’t ever need to eat the “real deal” ever again. This recipe seemed a little complicated for me, mainly because the words “constant whisking” scared me off, but it was really super easy. The best part about it is that it’s 8 freaking servings! So, I was just planning on making dinner, but it turned into lunches for the rest of the week! Just a few notes on how I made this as easy as possible. 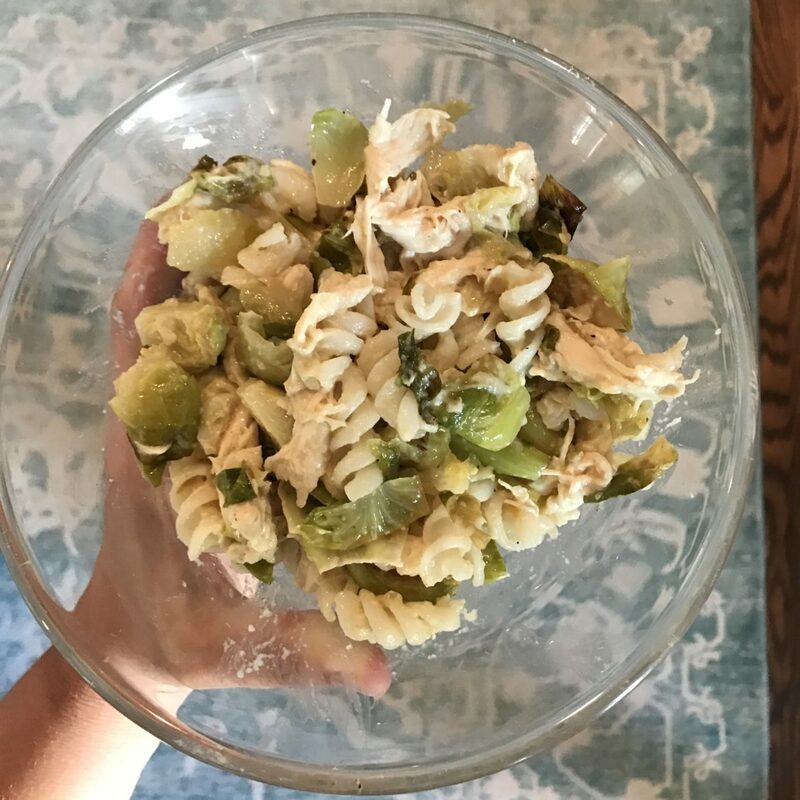 I used a rotisserie chicken (because I’m lazy AF), and I cut and cooked the brussel sprouts while my kids were eating dinner, so that was already done before I ever actually started cooking. If I could do it again, I would get those shaved brussel sprouts from Trader Joe’s and that would have taken out an entire step. Let’s be honest, the less I use a knife, the better. You could use green beans or broccoli instead of brussels, but I love brussels and already had them. I made the pasta, brussels sprouts and pulled the chicken earlier in the evening, so all of that was ready to go and cleaned up before we started the rest. 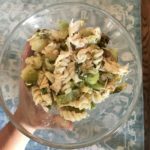 I have a gluten allergy, so it was really easy for me to make this gluten free, but you could use whole wheat pasta and regular unbleached flour. I kind of wish I had stuck to the shredded sharp cheddar so it was more orange colored, because mac and cheese is orange, amiright? Anyway, give this a try…it’s INCREDIBLE! Cook macaroni according to package directions. (Do not use salt or oil if suggested in directions.) Set aside. Melt coconut oil in large saucepan over medium heat. Add flour; cook, whisking constantly, for 1 minute, or until brown (don’t let it burn). Slowly whisk in almond milk; cook, whisking constantly, for 1 to 2 minutes, or until mixture thickens and there are no lumps. Reduce heat to low. Add cheese; cook, whisking constantly, for 2 to 3 minutes, or until melted. Add macaroni, chicken, brussels, salt, and pepper; cook, stirring constantly, for 1 minute, or until heated through. Serve immediately, 1.5 cups per serving.